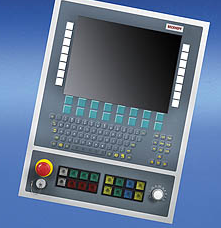 New Control Panels have been developed for universal application as control units for the tool machine industry. The U-shaped arrangement of the control keys (i.e. control keys arranged on the sides and function keys below the display) matches that of the Transline concept commonly used in the automotive industry. A push-button extension that has been optimised for PLC applications is available for simple and convenient machine operation. Control Panels with tool machine push-button extension are optionally available with built-in or mounting arm housing. As with all Control Panels, the design, equipment, functionality, etc. can be adapted to customer requirements. Additionaly all push-buttons are directly wireable with a second normally-open contact via a terminal row. All indicator lights are controlled exclusively via USB.